Whether you’re a sewing newbie or an old pro, mistakes are just a fact of life. However, most of the time, we don’t really want to reach for the thread snip or the seam ripper. In fact, trying to go back and do it right could lead to even greater mishaps. And, in any case, the fabric has already been perforated by the machine needle. So what are we to do? Well, if you want to learn how to cover up sewing mistakes, you’ve come to the right place. There are many sewing mistakes that make your clothes look homemade. Most of the time, that’s not the look we’re going for with our sewing projects. Today, we’ll talk about some of the ways we can hide sewing mistakes, rather than fix them outright. 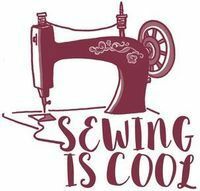 But before we get to our tried and true tricks for covering up mistakes, let’s talk about some of the most common sewing machine mistakes we tend to do over and over again. The fact of the matter is that most of the things that make our projects look homemade are of our own doing. Although sewing machines can indeed make a lot of mistakes all on their own, sometimes we’re the ones who are responsible for doing a bad sewing job. So if you want to find out how to cover up sewing mistakes, it’s best to start by knowing how to avoid the really obvious ones. We’ve all, on occasion, used the wrong kind of fabric for a certain project. That’s simply a part of learning how to sew. Unfortunately, there’s really no way to undo this mistake. The best we can do is learn from it. However, if you want to avoid choosing the wrong fabric in future projects, you can simply use the exact material the pattern recommends. Most patterns have several fabric suggestions you can use that have similar features. You can bring the whole list of possible fabrics to the store with you. Writing down some possible colors you’d like to see will also make the process of shopping for fabric easier both for you and the store clerk. On the other hand, if the pattern comes with a photo of the final result, you can also visually estimate the kind of fabric you’ll need. For example, if the dress in the photo looks a bit stiff and stands away from the body, don’t use slinky materials to make it. There are several tips that will save you from having to recut a new length of fabric. For one, you should get enough of the fabric you’re using, taking into account the fact that you may have to add something to the final piece. However, there are also other things to consider as you’re laying your tracing paper onto the fabric. Of course, we’re referring to the pattern, the nap, and the grain of the fabric. 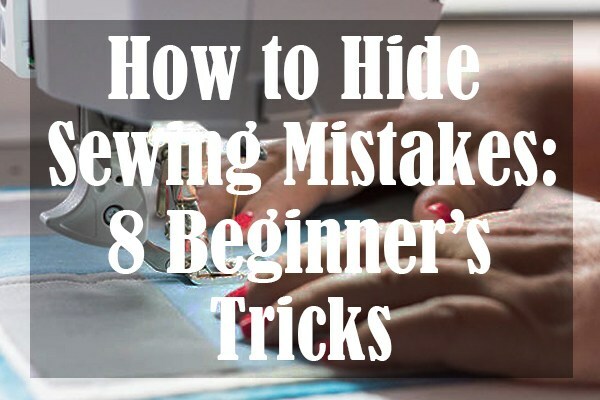 Learning how to cover up sewing mistakes won’t really help you if you’re making beginner’s mistakes. To begin with, let’s talk about the grain of the fabric. Typically, woven materials have parallel or crosswise textures that help us position the pattern pieces so that they’re straight. So if you’re working with a woven material, always place the pattern along with the grain. That way, you’ll be able to cut in that direction as well. If the fabric only has grain, and no pattern or nap, you can position the pieces with only the grain in mind. In fact, patterns and nap only make positioning of the pattern pieces more difficult. Both of those factors mean that you’ll need to place all of the pattern pieces pointing in the same direction, which does use up more space. However, if you don’t position the pieces correctly, you’ll find that the final product will have pieces of different colors — because the nap is facing the wrong way — and a pattern that doesn’t align. Ultimately, when it comes to patterns and the fabric nap, beginners should stick to the basics. Once you feel more confident about working with solid colors, you can move on to the next level. Although sewing can be a hobby with lots of room for creative expression, we must caution beginners against improvisation. Pattern markings are there for a reason. Ignoring the markings that tell you where to fold your fabric and how to sew your stitch can only cause a lot of problems later down the line. And then, you’ll be back on the Internet again, looking up how to cover up sewing mistakes. However, that’s not to say that you shouldn’t make any alterations to your pattern. In fact, you should do everything you can in order to end up with the best piece for your own body. Still, that means sitting down and carefully considering exactly how you’ll alter the pattern and what kind of impact that will have on the piece as a whole. 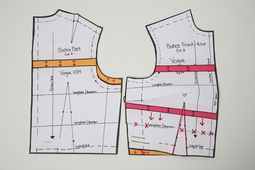 It’s all about planning — just make sure to plan for the stitching allowances as well. Believe us — no one wants to keep an iron on hand. However, it’s one of the best sewing tools in our arsenal. 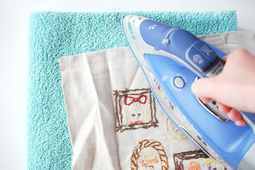 Ironing your fabric before you start and pressing the seams as you go are some of the most important ways to avoid sewing mistakes that make your clothes look homemade. 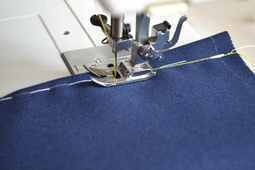 Hemming stitches are the most visible ones on any piece of clothing. That’s exactly why you should be particularly careful when the time comes to wrap up your project. Using the wrong hem finish can make your piece go from great to horrific within moments. Then, you’d have to unravel the seam, hoping that the needle didn’t damage the fabric too visibly and try again. Essentially, you’d be relying on the fact that your sewing machine hasn’t damaged your project too badly. Frankly, that’s not a bet we would take. When we’re operating a sewing machine, there are plenty of things that can go wrong. Between the machine itself and our own inexperience, there are lots of ways a project might turn into a bad sewing job. In fact, you might just be dealing with a faulty sewing machine. Or you may have forgotten to oil yours. In that case, consider this as your reminder. But if you’re up-to-date with the maintenance of your machine, and it keeps malfunctioning, you may be able to blame the mistakes on your machine. 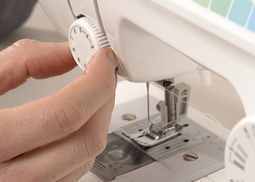 As it turns out, there are plenty of common sewing machine mistakes that may be the cause of your troubles. For example, if you’re finding little holes in your fabric, it may be because your machine is taking bites out of it. That would be a truly big problem that you’d need to resolve. However, if you’re in the middle of a project, your best bet is to figure out what’s wrong and fix it. As for the holes that are already there, don’t worry: we know just how to cover up sewing mistakes like those. Another thing that could be chalked up to your machine is fabric bunching. However, you ought to check if your presser foot has been lowered before pointing fingers. The presser foot is the bit near the needle that comes down to hold the fabric in place. In addition, the presser foot prevents your fabric from jumping and bunching. If everything else checks out and your presser foot is in place, something else may be causing the jam. 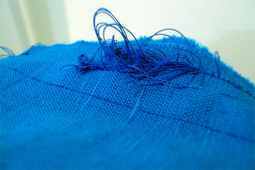 If your fabric is bunching as you run your stitches, you can be sure that unwanted holes in your fabric are the next thing that will pop up. And if it’s not a question of the pressure foot or something that can be fixed by adjusting the tension dial, you should get used to seeing holes in your fabric for as long as you’re working on that machine. If you’re experiencing a lot of thread issues, it could be due to a fault in the design of the machine. The thread could be snapping or slipping off the needle. The latter is definitely a problem you’d have to take up with a repairman, and you might even have to go to the manufacturer. However, snapping thread does have an easier solution. Just switch out the thread you’re using. Even if it’s in the middle of a project, it’s best to continue with a stronger thread than the one that’s too thin to work with. A polyester or nylon thread would be ideal because synthetic materials are less likely to cause problems than pure cotton. If you don’t really understand how to choose the right thread for a project, you should at least know how to cover up sewing mistakes that involve stitches. If you’re a sewing beginner, you’ll be happy to know that buttons and zippers are often problems even for experienced seamstresses. Sewing machines nowadays come with all sorts of features that are supposed to make our lives easier. However, what we’re left with is a machine that just takes over and makes the same mistakes we would make working by hand. Before sewing machines could punch and stitch our buttonholes, we had to do them by hand. Don’t misunderstand us — we love the fact that the process is easier now than ever before. Still, it can sometimes misfire and create a big mess. Luckily, if you want to know how to cover up sewing mistakes that are the result of botched buttons and zippers, you’ll be pleased to learn that it’s easier than you’d think. All it takes is a bit of creativity. So far, we’ve been listing the most common sewing mistakes that make your clothes look homemade. Some of them are the result of working on a faulty machine, while others are due to other factors. However, we’ve yet to say how to cover up sewing mistakes like the ones we’ve talked about. Allow us to rectify that. Ask any seasoned seamstress and she’ll tell you that the surefire solution to many sewing mishaps is a well-placed applique. Appliques are decorative pieces you can sew or iron onto your work to make tiny mistakes disappear. If you have some felt at home, you could easily make a whimsical applique to cover a hole on your kids’ clothes. The same goes if you love embroidery. After you’ve embroidered your design on a loom, you can cut it out and sew it onto your sewing project. However, appliques are also commonly found in craft stores. In fact, you can basically get them wherever you usually get your thread and zippers. The store-bought appliques are most often the ones that can be ironed on to your fabric. If appliques aren’t your style, perhaps some lace or ribbons will do the trick. These will cover up any holes in the fabric. Additionally, you can even use them to hide bigger mistakes, like fabric bunching or accidental pleats. A wider ribbon or a strip of lace can also hide your seams. So what if your machine has skipped a few stitches? You can cover the side seams and even the bottom hemline entirely with a strip of ribbon or lace. And, the finished result will look great too! Just like you had planned it. However, if you find yourself having to figure out how to cover up sewing mistakes often, you may want to keep some lace, ribbon, and appliques on hand, just in case! Finally, decorative buttons can also spruce up your outfit. Big, eccentric buttons can not only hide the occasional buttonhole mishap but also deal with holes in the fabric. Best of all, they can be a bit like permanent brooches and bring a whole new vibe to your piece! In addition to using decorative buttons as a distraction from the mistake, you can also cover your tracks with magnetic snap buttons. If you just love the idea of hiding your accidents with a pretty piece of lace, allow us to introduce you to the wonderful world of lace zippers. Zippers can be notoriously hard to sew, even for experts. However, many beginners have been known to accidentally damage the fabric around the zipper in their attempts to finish their projects. That’s exactly why we’ve tried to find the best solution in order to explain how to cover up sewing mistakes around zippers. Well, if you’ve already attached the zipper and don’t want to ever think about it again — that’s understandable. Sometimes a project can get so frustrating that we end up not even wanting to wear the thing we’ve made. But even if you have fabric bunching around your zipper, you can easily cover it up with strategic lace placement. As long as you make sure that the zipper is accessible, you’ll be fine. You can make a statement by using a strip of contrasting lace or make it match the zipper you’ve installed. On the other hand, if you want to take out the zipper, you can do so after carefully removing the stitches with a seam ripper. Then, you can hide the needle holes with a decorative lace zipper. If you want to know how to cover up sewing mistakes, the one piece of advice we’ll give you is to remain calm. For example, if you’ve noticed that your stitches are uneven or slightly crooked, don’t panic. Instead, finish the seam all the way through, making sure to remain as straight as possible. Then, before you decide if you want to cover the seams with lace, as we suggested earlier, iron the seams. Oftentimes, all you have to do is to follow through with your original plan. So here, ironing would be the next step and, in this case, it would flatten some of the irregularities. However, if it becomes apparent that some kind of cover-up is in order, you can use lace and ribbon, as we said. And, after you finish the project, we also recommend giving your machine a proper once-over. The machine itself could be the reason why your stitches were uneven. Therefore, it’s best to prevent similar mistakes in the future. Another problem we’ve already mentioned is not aligning the pattern of the fabric properly when you’re laying the pattern onto it. Well, there’s not much you can do to avoid having your piece look odd once you’ve done this. However, some people have been known to color in the pattern to make it look a bit more balanced. For example, if you’ve misaligned a striped pattern, you could use Sharpies or Pigma Micron pens in similar colors to conceal the mistake. Still, if you’ve flipped the pattern in the back and the front, there’s nothing to do but wear your lopsided creation with pride, no matter what. If we’re talking about a floral pattern, you could disguise the seam where the materials meet with ribbons, lace, or floral appliques, as we’ve previously established. One of the most common issues people have when they’re looking to find out how to cover up sewing mistakes is that they’ve made their clothes too big or too small. As a beginner, you should actually get used to minor size discrepancies. Until you learn how to properly measure yourself and adapt patterns to your own body, you’ll always have something to fix. Fortunately, there are a few things you could do to make sure a baggy garment is sitting right. For one, something you can do with no further stitches is to just call it “oversize” fashion. However, if you want to put in some effort, you can flip the garment inside out and take in the shoulder seams and the side seams. In fact, if you really want to give it your all, you can try to take in darts. Darts are a technique for taking in specific areas of clothing by folding the fabric and stitching it. You’ll be able to find plenty of tutorials about the subject online. It’s better to see it done than to explain it verbally. But if you don’t want to bother correcting the mistake, we’re sure you’d be able to get away with wearing the piece as is. On the other hand, if your final result is too small for you, there is but one thing to do. If you’re reluctant to unravel the seams, you may have to pass it along to a loved one. We’ve all been there! However, if the piece is just too pretty to give up, making it bigger will take some work. First, you’d unravel the seams with your seam ripper. Then, you could insert extra fabric, even contrasting or elastic pieces, on the sides. At the end of the day, our sewing mistakes can be a wonderful opportunity to showcase our creativity. Much of the time, we’re sewing according to someone else’s patterns, anyway. So these “mistakes” can be a great way to make a piece our own! To borrow from Bob Ross: “We don’t make mistakes, just happy little accidents.” That is exactly the mindset we ought to bring to sewing if we want to keep enjoying it. After all, one of the worst sewing mistakes you can make is allowing mistakes to bring you down! Do you have other ideas on how to cover up sewing mistakes? We’d love to hear about them in the comments below. And, if you have a friend who could use some of these tips, you can share this post with them!